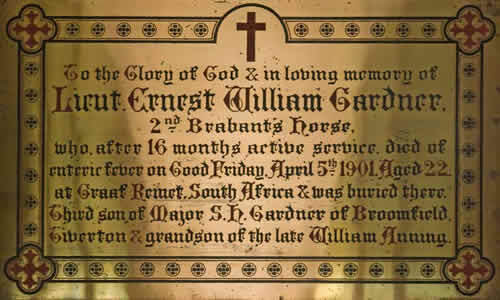 Lieutenant Ernest W. Gardner of the 2nd Brabant Horse. Son of Major Smith Gardner and his wife Mary. Born in Galway, Ireland in 1879. Died of enteric 5 May 1901 aged 22. 4639 Private Walter S. Underdown of the 19th Hussars. Son of James and Elizabeth Underdown. Born in Kilmington in 1880. Died of disease 25 January at Standerton. (Number not known) Private Benjamin G Smith of the Devonshire Regiment (Battalion not known). Son of William and Rebecca Smith. Born in Swindon, Wilts in 1875. 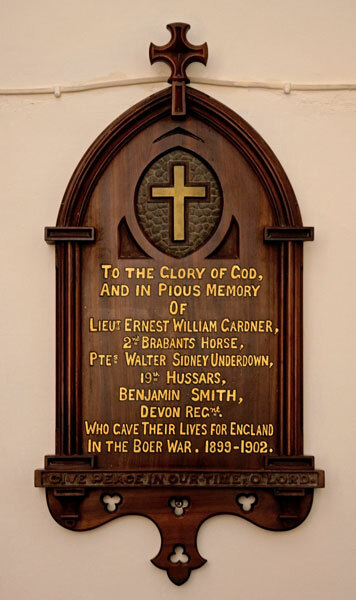 Not listed in Exeter Cathedral so no further information available on any website.